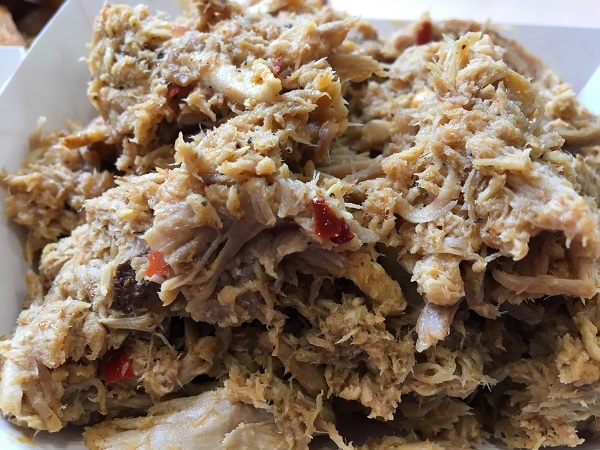 Rodney Scott’s Whole Hog BBQ, Birmingham AL – Marie, Let's Eat! We haven’t had a lot that we’ve wanted to write about, but after pacing the floor for months waiting for Rodney Scott to open his place in Birmingham, the least I could do is tell our remaining six readers about it. So yes, the blog is mostly dormant. I tend to go at things in cycles of about seven years and then they turn into work and then I resent them. This has happened all my life. So it’s been with food writing. The appetite is there, but not the muse. We’ve been eating mostly quite well, but taking far, far fewer trips, and not really feeling like scribbling and coding anything later on. Right now, I’m happier with writing about old TV. Far, far less work. But I’m still aggravated that one of my hopes for the blog never really came to fruition. When we moved to Tennessee, expecting more enthusiasm and more traveling money than we ended up having in 2016-17, I really wanted to cover Alabama – and Kentucky – a whole lot better than we had, and envisioned lots of road trips and exploration. But money was a lot tighter than we expected for a long time, and often, when we did travel, we didn’t find anything really wildly interesting. Now that we’re more secure than we were, I hope that’ll change a bit. All we need is time… and the muse, I guess. Our son, who is now almost eight years old, has still been turning his nose at barbecue, so I hoped that we’d please him when we rolled into town by starting the day with a hot dog from that tour I once wanted to make, because this kid freaking loves hot dogs. The omens were bad from the outset. We started our day at Sam’s Super Samwiches, but they don’t serve hot dogs for breakfast, just egg sandwiches and the like. Our kid was crestfallen. You know where you can get a hot dog for breakfast? Nu-Way in Macon. Well, he grumbled a bit over the bacon sandwich but a few hours playing at the McWane Science Center cheered him up. He’s mostly aged out of children’s museums, plus he’s big and clumsy enough to be a threat and a menace to the much smaller kids, so science museums and aquariums are more age-appropriate for him. McWane is a real treat and he had a blast, and he was in very good humor as we made it to Rodney Scott’s, in the Avondale neighborhood, around 1 pm. The line was out the door the whole time we were there and we had to park on the neighboring street. I am thrilled that the initial buzz was so positive that the store was bringing in such a big crowd when we were there. The food that we tried is completely wonderful. This is easily among my all-time favorite chopped pork. It tastes absolutely like I remember my previous two experiences with it, when I drove out to Hemingway in 2012 and when Rodney visited Atlanta for a pop-up in 2014. It is tender and absolutely explodes with flavor and, and… and you can tell I haven’t written a word about food in months, can’t you? I was never very good at this, but surely once upon a time I could get a little more detailed than this. I do think visitors should be very conservative with the medium-spicy vinegar-pepper sauce. Give it a good shake and just use enough for the next couple of bites, then add more. The greatest part of the meal wasn’t even the pork, actually. It was our son agreeing to try Rodney’s smoked turkey and watching him inhale it all with gusto. He absolutely loved it. He loved it so much that he didn’t offer to share, and it didn’t occur to me to ask. He’s not interested in pork, and he’s not interested in anybody’s barbecue sauce, but he’ll happily order chicken or turkey in a barbecue place. That’s fine by me! We didn’t linger, because our table was needed, and so we skedaddled out. We made our way to the old Sloss Furnaces for some exercise, and then did a little driving around. We saw that Pat Martin has also been bringing whole hog cooking to Birmingham. There’s a Martin’s Bar-B-Que Joint, the ninth in his chain, in the Vestavia Hills suburb. The tenth store is opening in Rodney Scott’s home turf of Lowcountry South Carolina later this year. 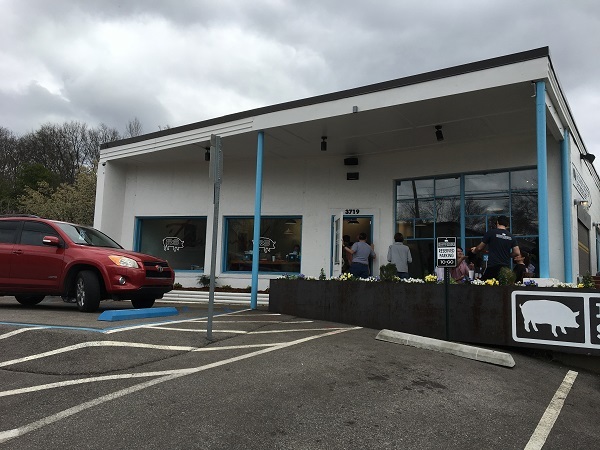 Martin has also opened two additional Hugh-Baby BBQ & Burgers stores in Nashville. If anybody knows how to get Chattanooga on either of these fine men’s radar, I sure do wish you would. We tend to eat fairly well here – on a Saturday when we visit Zarzour’s, we eat exceptionally well – but we could always eat better. As for what we were doing in Vestavia Hills that wasn’t eating at Martin’s, perhaps I’ll come back to that another day. 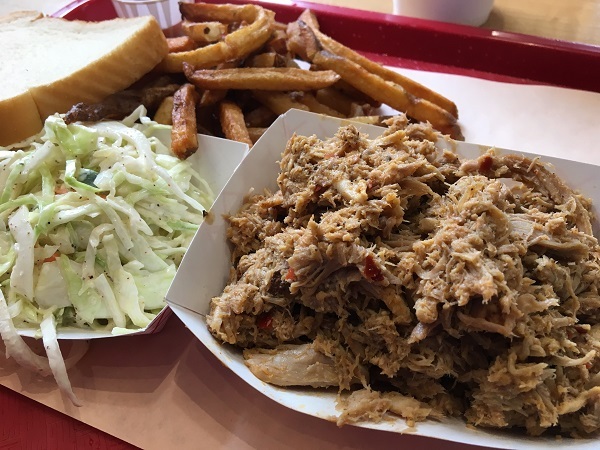 Posted on April 6, 2019 by Grant G.Posted in alabama, barbecue, birminghamTagged alabama, barbecue, birmingham. We just rolled into town after a LONG drive in a cargo van (we seem to be moving furniture back and forth this weekend) and this looks SO GOOD. Wish you had come out of your blog slumber a week earlier. Last weekend we were in Birmingham for my daughter’s college softball games and tried Dreamland on the way out of town. Not bad, but I can name 5 places within a 20 minute drive of our home in Marietta that are much better. We will definitely try Rodney Scott’s on the next visit. Glad to see action on your site. Hopefully this is the just the beginning of the action. I still tell folks to visit it for good reviews, especially if they are traveling. Grant – good to see you back in action. Hey – you need to go to Ms Myra’s in Vestavia Hills, Archibald’s in Northport or Saw’s near Homewood. Every one puts the B’ham Dreamland to shame. And while I haven’t been to the new Rodney Scott’s there, the Hemingway location is destination ‘cue. So glad to see y’all back on the road! I’ve been going to B’ham frequently in the last year. Rodney Scott’s has been on my radar. I’m excited to try it on my next visit.